For awhile, I've been grilling steaks and chicken with simple ingredients like salt and pepper, mostly to retain original meat flavoring. After a few BBQs at friends places, I found that marinating and preparing the night before really improves the flavor. So this week, I went to Costco and got a piece of Prime Tri-Tip Roast (it came in two pieces, about 3 lbs) and found this grilled recipe. While browsing online for recipes, I stopped and decided to use this recipe because it had ingredients that I mostly had on hand already, except the lime. The recipe instructions were easy, which basically involved mixing all the non-meat ingredients together, and then marinating. While heating up the grill, I found the instructions for determining when the meat was done a bit lacking. The recipe stated for medium rare, grill for 10 minutes on each side. But what if the total weight of my tri-tip was only 3 lbs instead of 4 lbs. 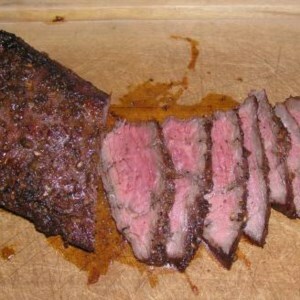 What if the thickness of my tri-tip was different than the recipe? What my grill was more or less powerful than the recipe? And should I cover the grill while cooking (I assumed yes on this). To insure the meat was cooked to medium rare, I looked up that meat should reach 140 degrees for medium rare. So in addition to the timer (for 10 minutes on each side), I also used my wireless thermometer. I left the grill closed the whole time, except to put out flames when I initially put the tri-tip on the grill. To my surprise, both the timer and the wireless thermometer went off within one minute of each other. The result was perfectly cook tri-tip. One piece was slightly larger than the other, and that piece came out more medium rare than the other, which ended up being perfect since I had the same meat with two different doneness (if that's a word). The flavoring was not overpowering at all (even though I ended up marinating for over 24 hours). Everyone loved the meat. This is a recipe I'm keeping and will use again in the future. Place the loin tri-tip roast in a zip lock bag and add in the mixed marinade. Let sit overnight (occasionally flipping the bag). When fully marinaded, pre-heat the grill to medium-high and grill the meat to desired doneness. For medium rare, about 10 minutes per side. When done grilling, transfer to cutting board, tent, and let rest for 10 minutes. Cut diagonally across the grain, and serve!